What does artificial intelligence have to do with Twitter? Your instinctive answer to this question may be nothing… but you would be wrong! Artificial Intelligence allows us to automate all kinds of processes that until now were done manually, quite like creating promoted tweets or optimizing campaigns, and do it much more efficiently. 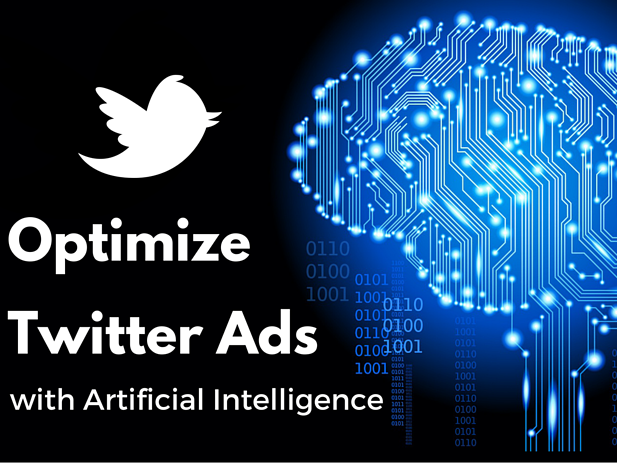 This is why I would like to explain to you how to optimize your Twitter Ad campaigns with artificial intelligence. With over 316 million active profiles worldwide, and 8 million just in Spain, Twitter is an advertising platform with vast potential. More than 62% of users have confirmed that this network is the quickest information source, allowing people to feel a real time connection to the world. A very unique characteristic of Twitter is that 85% of active users access it from a mobile device. This opportunity is particularly interesting in Spain, as we are one of the countries with highest usage of smartphones (72% of the population). Furthermore, in many cases its usage is dual screened (Twitter + TV): users comment using their mobile devices about content they are watching on TV at that moment, which offers unique opportunities for direct engagement between brands and their potential audience. Without a doubt, Twitter Ads is a great opportunity to achieve great results requiring only a small investment. 2# What is Artificial Intelligence? In a nutshell, artificial intelligence is what’s in charge of designing and creating systems that are able to solve problems on their own, using criteria based on human intelligence. More concretely, it’s the development of machines, systems or algorithms capable of imitating human thought, particularly the more logical and rational parts. It’s a multidisciplinary topic that incorporates knowledge not only from computing science but also from mathematics, logics and philosophy. The concept of artificial intelligence was suggested for the first time in 1956 by American IT engineer John McCarthy. First of all, applying AI to Twitter Ads makes it possible to combine all possible variables in terms of creativity: videos, images and text. In this way, it automatically generates a large number of variables, searching through all possibilities for the one that is most profitable. Secondly, these advertisement variables are tested by running tests with different segmentations, also automatically, generating a huge amount of possibilities all at play at the same time. The system monitors results 24 hours per day, 7 days per week. Due to this, your marketing team will have access to all of the information at any given time, making decision-making significantly easier. The system is able to quickly identify the ads with greater CTR and ROI, those which achieve the best results with the smallest investment. After setting aside the less profitable ones, the campaign focuses on the ads that actually get results. But it doesn’t stop there, and one of the main features of artificial intelligence systems is that its algorithms are capable of learning. Based on the results of the campaign, your technological solution will know how to identify the most successful variables to implement them in future cases, making each campaign better than the last. Here at Cyberclick we have no doubt whatsoever: Artificial Intelligence is the future of Twitter Ads! This type of solution offers very clear advantages for agencies and advertisers. Thanks to artificial Intelligence, it is possible to optimize your digital marketing budget like never before. By automating the whole variable creation and testing process, we can identify quicker than ever the audience, text, image and video combinations which offer better results for your brand’s goals. This makes it possible for your investment to be managed better than ever, as the less productive variable are set aside much faster. Furthermore, the algorithms’ learning process makes each campaign’s investment better managed than the last. As the system automatically sets aside the ads that do not achieve results, the outcome is that your advertising budget will be spent only on the ads that truly matter. You will watch your ROI soar! Another great advantage is the ability to achieve new microsegmented audiences. The automation of processes allows us to dig deeper than ever, consider a large amount of variables that may define our audience and combine them between each other to really hit the bull’s-eye of the users that are most interested in your product or service, that have greater likelihoods of converting and benefiting your company. In this way artificial intelligence is able to discover new user profiles which you would otherwise never be able to reach out to. Lastly, improving your usage of Twitter with Artificial Intelligence is not looking to replace human teams, but instead to make their job significantly easier. Think of all boring hours of combining, segmenting and testing that you are saving: not only will you not have to pay those hours that your team would have to work, but now they will have those hours free to dedicate themselves and design new and creative ideas and strategies. Due to our creativity. Artificial Intelligence can smooth over our paths when it comes to combining variables, but it is no substitute for the creative capabilities of the human mind. Our challenge, our job, will continue to be designing the best messages, videos and images, that are truly able to create an impact and that are faithful to the personality and goals of each brand. Because machines do not know how to set goals. Artificial Intelligence optimizes according to the parameters we give it, but only the people responsible for the brands can actually define those parameters and goals: increase the visits to a webpage, the number of app installs, lead generation? This decision has to be made depending on the unique situation of each company and requires truly human intelligence. For our strategic abilities. If Artificial Intelligence solutions are the sailors who help us sail our brand’s ship into the harbor, then humans are the captains in charge of designing the strategic marketing plan. According to the history of each company, the current market situation and the goals you aim to achieve, we must design a personalized action plan to be able to make the most of the benefits. Because artificial intelligence does the heavy lifting, but we have to supervise the process. The ability to monitor the process 24/7 offers us a hug amount of data, data which we must use to make better and faster decisions. All in all, to make the most of having your brand on Twitter, bet on artificial intelligence! If you’d like to read more about the blue social network, check out this article --> 5 innovative ideas to start your surveys on Twitter.